Much of BC’s pre-election debate has coalesced around the free-for-all in corporate political donations—and understandably so, given the scale of the problem that’s been revealed by various investigations. 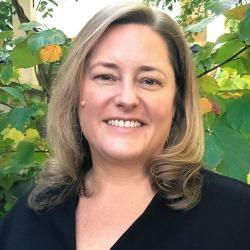 But worrying as the potential corruption of our democratic system may be, it’s not the only concern weighing on British Columbians’ minds as we draw closer to election day. A recent poll conducted by McAllister Opinion Research for the Canadian Centre for Policy Alternatives finds most British Columbians are also deeply worried about economic insecurity, inequality and the environment—and want our political leaders to take action. The results offer fascinating insights into how people feel about government services and taxes—and suggest the public’s priorities are different from what we hear from many political and opinion leaders. When asked to identify the one issue of greatest concern when it comes to BC’s future, the most common response relates to affordable housing and the cost of living (26% of respondents name this as their top-of-mind concern about the province’s future). The second most common responses relate to the environment (24%), suggesting that affordability concerns don’t come at the expense of environmental concern and values. Next up, jobs and the economy (15%)—another dimension of security. Concern about inequality is also reflected in people’s views about tax fairness. A majority of respondents feel high income-earners and corporations are not paying enough tax. Interestingly, it is not just those who plan to vote NDP or Green in the upcoming provincial election who feel this way. Strong majorities of Liberal and Conservative voters also think upper income-earners and corporations are not paying their fair share. We followed up this question by asking at what income level higher taxes should kick in. The majority of people (54%) think those making over $150,000 per year should pay more, and a decisive majority (89%) are in favour of higher taxes for anyone making over $250,000. Well over a third (37%) think people with incomes over $100,000 per year should pay more. Only one in 10 said no one should pay more tax. These responses are not surprising in light of views on the distribution of income in Canada. British Columbians want income to be much more equally distributed than they believe it to be now. We can only speculate as to how much stronger concern about inequality and support for fair tax reform would be if people knew just how offensively large the income gap has become. Despite feeling that the rich have an unfair share of the income pie and should be paying more in taxes, surprisingly, most British Columbians are willing to entertain paying higher taxes themselves in order to support concrete investments — even an increase in the carbon tax, which as we know has not always been BC’s most popular tax. These numbers are quite remarkable. They mean BCers are prepared to personally contribute more in carbon tax, provided the money is used for concrete investments in public services, climate-related infrastructure, and to help lower and middle income people offset the carbon tax. There are interesting differences in who is most and least willing to entertain increases to the carbon tax, and under which conditions. Regionally, people in Metro Vancouver and on Vancouver Island/Coast are relatively more enthusiastic than those in the Southern Interior and in particular the North. Yet even in the North — where residents have the most on the line when it comes to stepping back from oil and gas development, and where the carbon tax was most controversial when first introduced — a little over 50% favour a gradual increase in order to transition BC away from fossil fuels. And Northern respondents favour an increase in the carbon tax in order to invest in health care and education just as strongly as their counterparts in every other region of the province. Even when it comes to increasing the carbon tax to combat global warming, Northern respondents are evenly split (with 41% in favour and 40% opposed). 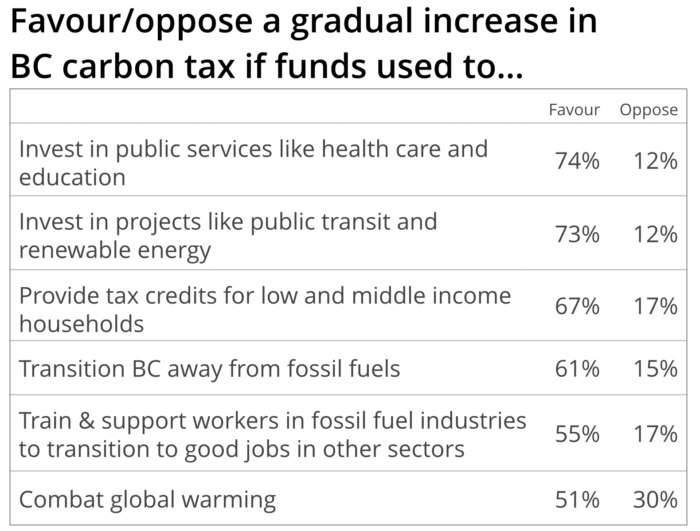 And how’s this for an interesting finding: those who say they would vote for the BC Liberals are no less likely than the average British Columbian to support a higher carbon tax to pay for each and every one of the actions listed above. NDP and Green voters are even more supportive of the BC carbon tax than average (Greens in particular). Women, particularly younger women, who are also bigger fans of the NDP and Greens, likewise tend to strongly favour increases to the carbon tax. Does this mean most British Columbians are walking around wishing government would charge them higher taxes? Not likely. Indeed, early in the poll we asked respondents how they feel about the amount of tax they currently pay. Not surprisingly, most people feel they pay too much, though 29% say they pay about the right amount. The key is in the link to concrete concerns and needs. What these poll results suggest is that despite the very real squeeze on middle and lower income British Columbians, their appetite for leadership on key challenges facing our province is strong enough that most are willing to personally chip in through higher and more fair taxes. And heading into an election, that’s a remarkable place to be. McAllister Opinion Research was retained to design and conduct this survey. The sample of 1,194 BC residents aged 18 years or older was recruited from an MRIA Gold Seal accredited panel designed to replicate a cross-section of the Canadian population. The survey design included an over-sample of respondents on Vancouver Island and in Northern BC to increase the reliability of inference in areas of low population density. Weighting was applied to the data according to BC Statistics projections for 2017 figures on region, age and gender. For a non-probability sample like this, both design effects and a Bayesian credibility interval are calculated to provide an estimate of accuracy. Taken together these indicate that there is a 95 per cent probability that the true percentage of responses in the overall population will be within at least plus or minus 3.0% of the results reported. For the sake of comparison, a true probability sample of the same size would have a margin of error of plus or minus 2.9% 19 times out of 20. Further detail on methodology and full wording for specific poll questions is available on request. Source: Statistics Canada. Table 206-0031 – Upper income limit, income share and average of market, total and after-tax income by economic family type and income decile, Canada and provinces, annual. Accessed February 9, 2017. 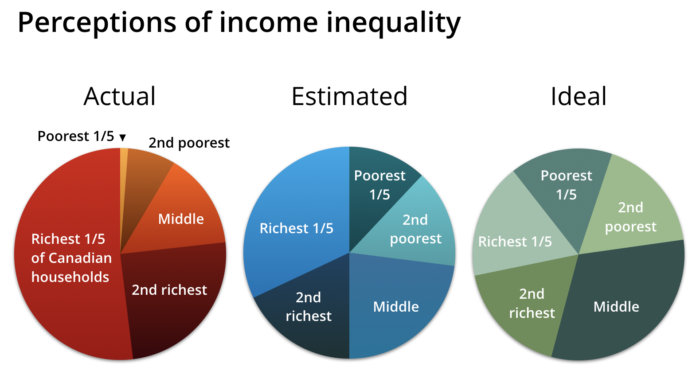 Respondents were so enthusiastic about redistributing income towards the middle quintile that on average respondents allocated it an ideal share of the pie greater than 20% (a perfectly equal share). We are grateful to the following organizations for their financial support of this research: Vancity, BC Teachers’ Federation, Federation of Post-Secondary Educators, Hospital Employees’ Union, Health Sciences Association.